The remains of a Russian airliner are seen at the crash site as rescue crews wait in the al-Hasanah area in El Arish city, north Egypt, November 1, 2015. 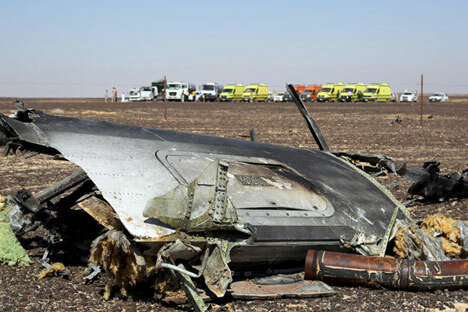 Russian specialists have studied the condition of the flight recorders found at the air crash scene in Egypt, Russian Transport Minister Maxim Sokolov said on Rossiya One television on Nov. 3. "Our specialists have already inspected the scene of the air accident and studied the condition of the flight recorders. They had a chance to familiarize themselves with the materials beforehand, at the air traffic control center in Cairo," Sokolov said. The Russian specialists - representatives from the Federal Air Transport Agency, Kogalymavia which operated the flight, the State Corporation for Air Traffic Management and the Interstate Aviation Committee - have been working since November 1, he said. "They were given relevant powers and together with their Egyptian partners will take part in the investigation at its every stage," the minister said.